I’ve always felt that cooking for just one or two person is “expensive” – the amount of groceries you buy and the time you spend preparing the food just doesn’t seem worth the effort. Just ask someone who lives alone. Especially in Asia where we can easily find food nearby almost anytime, not many people would choose to prepare their own meals. As someone who is diet conscious, I’m constantly in a dilemma. Hawker food may be fast and cheap, but most of them aren’t the healthiest choices. Would I want to cook more often for myself? Yes, but I hate having to buy more than what I need at the supermarket and end up wasting all the unused ingredients. ChefBox is a new company that attempts to solve this problem in Singapore. How does it work? 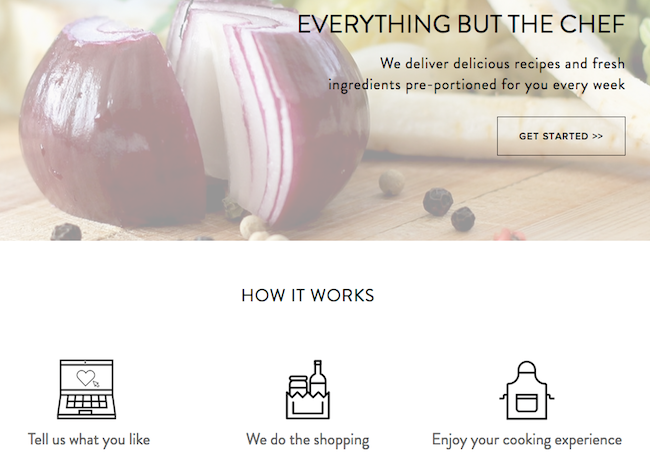 Simply tell ChefBox what you like and what you want to cook. 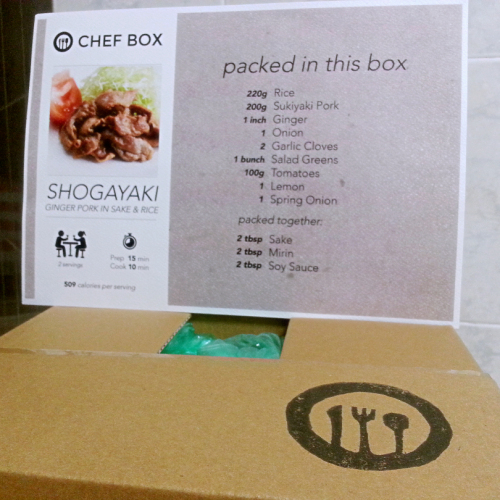 ChefBox will shop for the ingredients and deliver what you need in exact portions to your doorsteps. You can then cook the dishes you want. Not sure what to cook? 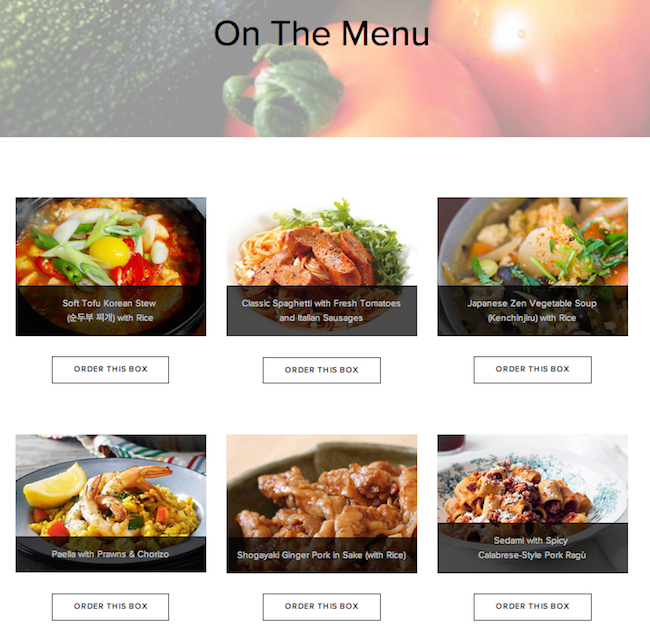 Every week, 6 new recipes across a variety of Asian and Western cuisines are also featured on ChefBox’s menu. You can follow the step-by-step cooking instructions and enjoy your meal at the comfort of your house. Since it’s only my mom and I at home this week, my mom is skipping grocery shopping since she doesn’t expect to cook much. I let her browse through the Weekly Menu and she ordered “Shogayaki Ginger Pork in Sake” to attempt to cook at home. Even with just six recipes to choose from, my mom found the menu interesting and was already looking forward to the next week’s update. The ordering process was very straightforward, although I faced some issues as the delivery timing options were limited, I am sure that will be easily improved in time. Overall, the experience was smooth. Simply pick a recipe you like, fill up the order form with your contact details and your ChefBox should reach you at your specified delivery time. There is no fixed subscription at the moment, so you can decide as and when you prefer to explore a new recipe! 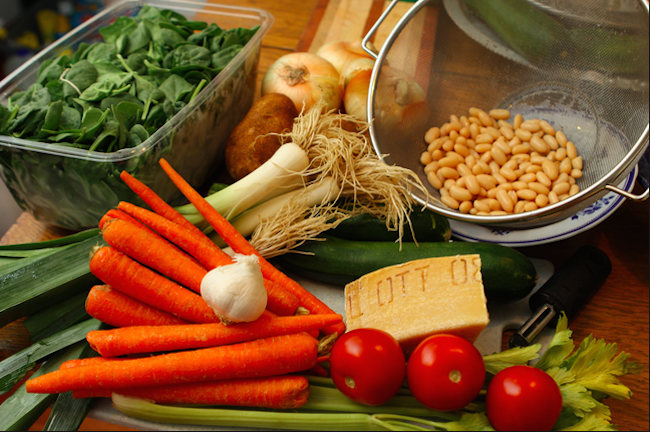 Here’s how my box looked like, along with the recipe and cooking instructions at the back. It also tells me how much calories I’m consuming, which is great for weight watchers! As a first-timer, it is fun to receive a ChefBox – I look forward to learning how to prepare a new dish, know what exactly I’m consuming, and I no longer have to make trips down to supermarkets or waste any ingredients. ChefBox will also be working with a charity organisation to match every box ordered with a meal donation. 1) Behold, Feedex Is About To Kill Lunch Queues In Singapore’s Central Business District! 2) Health Conscious? Singapore BoxGreen Delivers Monthly Healthy Snacks To Your Doorstep! 3) Time-pressed and hungry? Singapore new food startup Grain brings you a healthy surprise! We can’t help but notice this increase in popularity. Did we miss out any?